Dementia Australia has welcomed the ACT Government’s announcement yesterday on additional spending on the NDIS to support people whose needs are not currently met by the system, as well as the support for older Canberrans with mental health issues in residential care aimed at avoiding unnecessary hospitalisations. Dementia Australia CEO Maree McCabe said the NDIS was an important initiative that was vital to supporting people with complex disabilities, like younger onset dementia, in the community. “The additional $1.8 million in yesterday’s ACT Budget to establish an integrated services response program to support people with high and complex needs, not currently met by the scheme, will be crucial in supporting the almost 400 people with younger onset dementia in the ACT,” she said. Ms McCabe said Dementia Australia was pleased to see the targeted funding for individual advocacy services which will be funded as part of this initiative. “People with younger onset dementia often fall between the cracks of the disability, health, aged care and mental health systems and individual advocacy services, like the younger onset dementia key worker program, are critical for people living with dementia, their families and carers to navigate these complex systems,” she said. Another welcome initiative is the expansion of the Older Persons Mental Health Intensive Treatment Service with funding of $3 million over four years to provide additional mental health support in residential aged care facilities and to keep patients out of hospital. 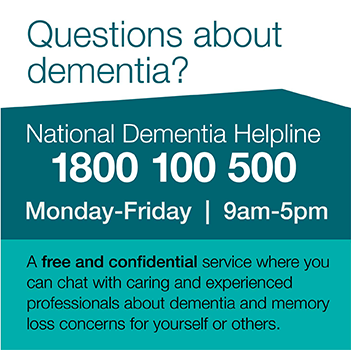 Ms McCabe said people with dementia often experienced issues with mental health, with 44 per cent of people in residential aged care having a mental health condition and any additional funding in this area was welcomed. Dementia was estimated to cost the ACT $218 million in 2017 and $586 million by 2056. Dementia is the leading cause of death among Australian women and the second leading cause of deaths overall. “Dementia is everyone’s business and it desperately requires well-funded support and services, responsive to local needs,” Ms McCabe said. When talking or writing about dementia please refer to the Dementia-Friendly Language Guidelines.